It doesn’t matter to the hoyas if you choose a plastic or clay pot. The important thing is to create an optimal environment for the roots. Normally I prefer clay pots for the climbing hoyas. I think they look nice and they are heavier than plastic. 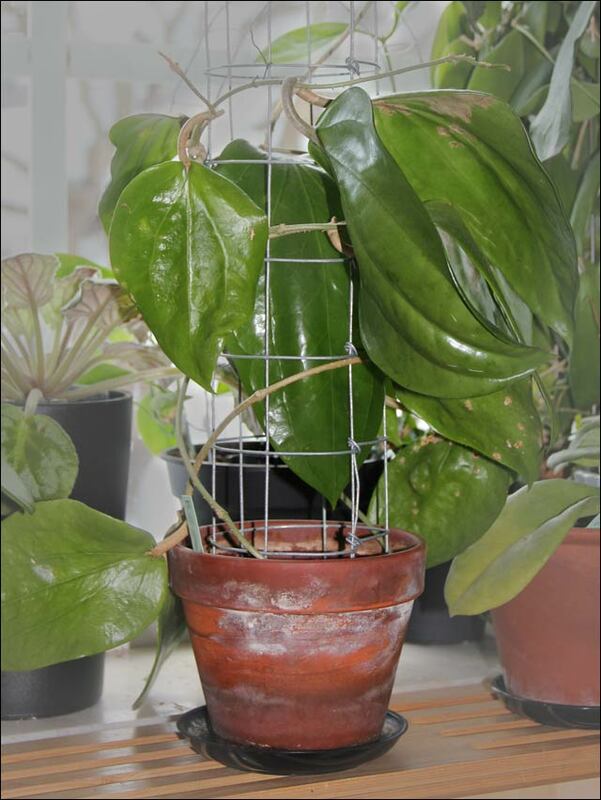 A big hoya on a trellis can overturn quite easily. Unfortunately my erratic watering habits during the last years have not been in favour of clay pots. A friend of mine uses self-watering pots and she has the biggest hoyas I’ve ever seen. Inspired by her I’ve bought some of my own, but unfortunately they can be very expensive. Now there is a fairly new brand that is in a much better price range and they also have a small size (12 cm) that fits the new cuttings once they have rooted in water. The company is called IndoorSprings and the pots Lively. Their web shop can be found here. 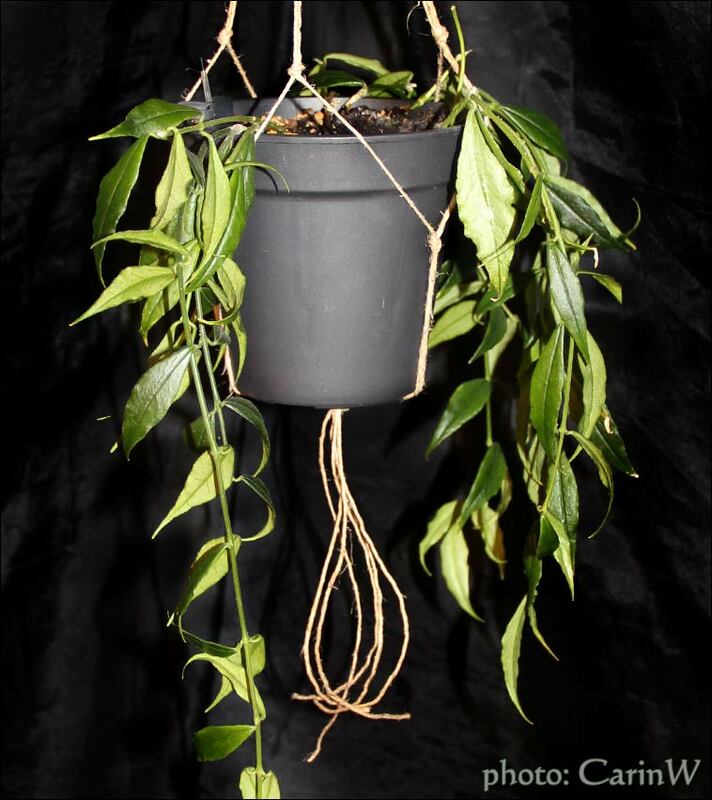 The Lively pots are also excellent for the hanging hoyas and it’s quite easy to make a device to hang them up with from 6 pieces of string and a few strategically placed knots. When it comes to choosing the right sizes of pots I tend to use rather big ones at least for clay pots. Some say that hoyas flowers once the roots reach the pot and I’m ready to go along with that. Whenever I have a hoya flowering for the first time I try to remember to look under the pot. Eight times out of ten there are roots coming out of the bottom hole. In my opinion the plants need humidity in order to develop big leaves and that is much easier to maintain in a bigger pot. When using self watering pots I tend to go a little smaller since the soil isn’t that important but the water and the fertiliser. I use any ordinary soil that I buy at my local supermarket. To get a good texture I mix 3 parts soil with 2 parts leca pebbles (2-6 mm) and 1 part vermiculit. The idea is to get a mix that doesn’t get waterlogged but still keep the moisture for a while. 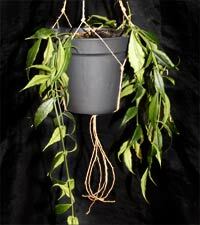 After having planted a cutting or repotted a mature plant I don’t use fertiliser for a month or two.